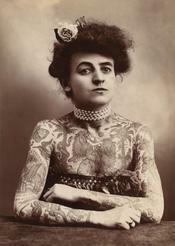 Tattoos are very popular in this day and age. They have aways been popular, but now it seems like everybody has a tattoo or wants to get one. People can run into all kinds of problems by getting a tattoo. If they are not careful, they could get diseases which could be fatal. Despite all the negative effects of tatttoos, people still get them. People get tattoos for several reasons like looking cool, gang-related, sorority and fraternity's, tribal reasons, or just getting something to symbolize love or hatred torward something. I got a tattoo because my mom kept telling me I could not get one; so I did it anyway. Which was a bad choice because I went to an unexperienced place, and my tattoo got infected. I also had to go get it done over because it looked unprofessional, but now it looks good. I just wish I would have waited and went to a better place to save all the hassle. My "To Do" List: Yay for functional tattoos! When a person decides that they are going to get a tattoo; where will they go? WriteWork contributors. "Body Art" WriteWork.com. WriteWork.com, 16 February, 2005. Web. 20 Apr. 2019. Hmmm, I think you're right in some senses here, like that people might regret getting tattoo. Although I'm all for free will, and if its their choice then fine, but there must be an age limit on it. 18 is a good age. I think 16 might be the legal age in Britain though. What is it in the US? i personally disagree with tattoos, but if a person is really intersted they should think about alternatives like henna tattoss. they are not permanant and you have a chance to have a tattoos for awhile.